In 1963 a Swedish-Finnish art historian, Göran Schildt, travelled with his yacht “Daphne” into the unknown Black Sea in the footsteps of Jason and the Argonauts. Jason’s story – or the combination of several narratives – is the first travel story mentioning the Black Sea in Greek sources. His quest for the Golden Fleece with the ship “Argo” is very popular and has inspired the world for 3,000 years. There are two Black Seas – one lives in the classical legends and is part of the European cultural heritage, based on Greek, Roman and western European traditions. The other Black Sea is the real sea, which has been the scene of a varied history, dozens of peoples moving along its northern and southern shores, colonisation by Greeks, Venice and Genoa, nomad empires and international trade. Sabira’s writings about the Black Sea deal with history, Nordic connections, Jason’s journey in history and its modern interpretation, and the trip to Colchis from the ship dog’s point of view – written by the author in four languages. 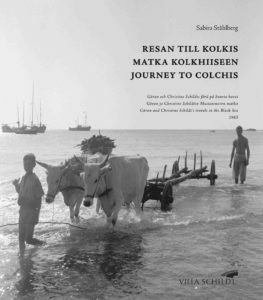 Göran and Christine Schildt’s travels to the Black Sea in the footsteps of Jason and the Argonauts 1963. Trilingual S wedish / Finnish / English, illustrated with photographs. The ship Argo makes a perilous journey to the faraway kingdom of Colchis with captain Jason, Hercules the hero, sour-faced Idas and Thracian singer Orpheus – and the fish-eating dog Mopsus. The Black Sea is a dangerous place for both men and dogs and the Argonauts encounter many adventures during their quest for the Golden Fleece. Iason unternimmt mit dem Schiff Argo eine gefahrvolle Reise ins ferne Königreich Kolchis. An der Expedition nimmt eine imposante Besatzung teil, unter ihnen der Held Herakles, Idas mit dem mürrischen Gesicht und der thrakische Sänger Orpheus – und der fischfressende Hund Mopsos. 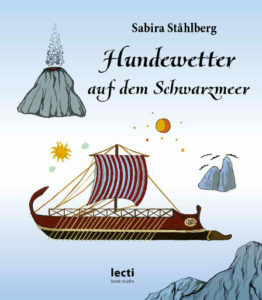 Das Schwarze Meer ist ein gefährlicher Ort für Männer und Hunde und die Argonauten erleben viele Abenteuer auf der Suche nach dem Goldenen Vlies. Язон и корабът му „Арго“ се отправят на пътешествие до далечното царство Колхида заедно със забележителен екипаж, включващ героя Херкулес, мърморкото Идий, тракийския певец Орфей и едно куче Мопсус, което обича риба. Черно море е опасно място за хора и кучета и аргонавтите преживяват множество приключения в търсене на Златното руно.